The Perfect Exposure Gallery is proud to present Vamos Bien! From Saturday Janurary 7th to February 2nd 2017. The exhibition, which comes after the death of longtime revolutionary leader Fidel Castro, will include recently discovered images by late photographer Charles Trainor along with images from 20 contemporary photographers offering a glimpse into the multifaceted country. 'On New Year's Day in 1959 Fidel Castro's guerrillas toppled Fulgencio Batista, a week later Castro entered Havana. Photographer Charles Trainor, traveling from Miami, documented the dictators first days as Havana celebrated with the rebels and the leaders of the new regime executed hundreds of Cubans in Morro Castle. 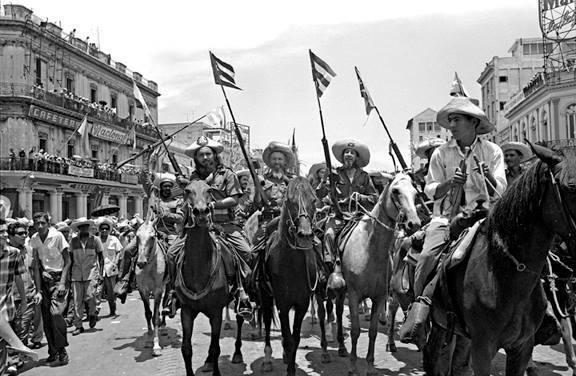 Trainor's images, only recently discovered, reveal a collection of hundreds of black and white negatives that recorded the parades and faces of the rebels and the Cuban people. Part II: The exhibit will also feature Cuba through the frame of 20 foreign and local photographers, offering a small glimpse into a country that remains alluring and mysterious to the general public, the photographers will include: Al Diaz, Alejandro Ernesto, Alisa Adona, Bryan Beasley, Charles Trainor, E.K Waller, Emily Corbato, Jason Zakrzewski, Jimmy Dorantes, kathy Park Wilson, Kip Harris, Leslie Bernstein, Malakhi Simmons, Mark Edward Harris, Rene Huemer, Roy Dybuncio, Susan Goldman, Victor Villegas, Vincent Hernandez, and Waleska Santiago. Charles Trainor (1927-1987) was a photographer in Miami from the 1950's to the 1970's. During the middle years of the last century Trainor crossed paths with subjects that would become icons in the present day. The photos of Elvis, The Beatles, and Ali not only defined his photography but also a city that was becoming a player on the world's stage. Miami was the point in all three of their history where the world took noticed, two with concerts and one with a fight. Trainor's dramatic photograph of the late U.S. President John F. Kennedy caught the attention of the late President who requested a copy of the photograph and returned one to Trainor with his signature. Over the years Trainor's work was published in national and international publications: Life and Look magazine, Paris Match, Geo, Sports Illustrated, Rolling Stone magazine and various books and documentaries. The Perfect Exposure Gallery is a recognized venue in Southern California to display the work of award winning and accomplished photojournalists as well as works of photographers that regard artistry and craftsmanship as a standard of excellence. The mission of the Perfect Exposure Gallery is to present exhibits free of charge to the general public with the following goals to exemplify the rich variety and impact of photography, freedom of expression, a forum for the aesthetic, the contemptible and the sublime.